The Movement works internationally, regionally and locally, pooling expertise and experience to enhance peace, justice and development in our societies. It partners with diverse stakeholders including the civil society, government, the private sector and the media to eradicate violence in all its forms by activating the power of women and youth to participate as key influencers, change agents and active partners in peace processes. The Suzanne Mubarak Women’s International Peace Movement (SMWIPM) is a non-profit, non-governmental association that was founded in 2006. The Movement’s over-arching objective is to translate the process of peace building into tangible actions that can be felt and experienced in people’s lives. Through need-driven programs we re-enforce existing developmental efforts and promote the principles of peace and non-violence as effective paths to achieving human security. By promoting dialogue, advocacy and awareness through its diverse initiatives, the association helps women and youth develop the skills to initiate and spread understanding, respect, and peace in their communities, their countries and around the world. Since its inception, the Movement has implemented programs that cover a wide range of interdependent themes including peace education, gender-mainstreaming, health awareness and the protection of the environment. It has also focused on using art to promote dialogue, tolerance and respect for cultural diversity. It has worked with the media to raise awareness about topics that threaten human security and violate human rights, including human trafficking and child abuse, as well as highlight best practices that strengthen peace building efforts worldwide. Driven and inspired by the unwavering energy and creativity of women from the grassroots to the decision making levels, the Movement continues to join hands with various partners to enhance participation of women in peace and human security policies and dialogues. In line with these efforts, the SMWIPM has created a Peace Matters lecture series that engages inspirational speakers to stimulate public discussions on the role of women in peace and human security issues. In addition, the lectures aim to encourage the active participation of civil society members in the promotion and advancement of the principles of the culture of peace. Every opportunity is used for forwarding our mission through advocacy and networking. The latter has taken many forms including conferences, seminars and colloquiums all over the world. The Movement organized in 2005 the Women Defending Peace Conference in Geneva, which brought together over 200 experts and activists dedicated to enhancing women’s participation in the peace and security processes. The Movement works closely with the United Nations system and other national, regional and international organizations to help strengthen legal instruments and tools dedicated to the enhancement of peace and human security. In 2004, the SMWIPM joined forces with the United Nations Fund for Women (UNIFEM), to organize in 2004 the Arab region’s first workshop to address the importance of UNSC resolution 1325. The event brought together 52 participants from 14 different Arab countries to discuss ways to disseminate the message and implement the recommendations of the resolution across the region. The success of this gathering recently prompted the Movement to organize a follow-up seminar aimed at encouraging participants to examine existing strategies being undertaken by governments and international organizations to tackle the obstacles hindering the institutionalization of this resolution, such as building cross-regional peace networks and enhancing efforts in the region to build a culture of peace. Building on these efforts, the Peace Movement is presently working with university students to integrate a UNSC 1325 component in existing Model United Nations (MUN) programs across Egypt by providing the MUN secretariats with a UN training on UNSC 1325 which would enable them to further discuss and work on the Resolution during their conference. Maximizing the potential of women in fostering security at the local levels, requires us to understand that their can be no sustainable development without eliminating the problem of extreme poverty, without addressing the marginalization and violence experienced by women in global societies. In this respect, the Movement is commuted to protecting women and children, especially girls, from all forms of violence and exploitation. Today, human trafficking has become a global problem especially affecting women and children. Most anti-trafficking initiatives have been undertaken by governments and non-governmental organizations but very few programmes have engaged the business sector and harnessed their global reach and connections. The Movement considered it crucial to involve the private sector in the fight against human trafficking. As a first step, the Movement - together with UNIFEM, UNODC, IOM, Geneva Center for Democratic Control of Armed Forces, the World Bank, the Foundation for the Child and Family -organized a Roundtable of Business Community Against Human Trafficking (Athens, January 2006) to generate interest among business leaders and to discuss options for their involvement in the anti-trafficking efforts. Business representatives adopted the Athens Ethical Principles – a code of conduct for companies declaring zero tolerance to human trafficking. The Principles became the main tool of the End Human Trafficking Now! campaign, coordinated by the Movement, which aims to create a global anti-trafficking coalition of businesses to edge this illicit trade out of legitimate business. *	Detect and identify potential victims of human trafficking. *	Provide specialized help and support to victims (shelter; medical, social and psychological assistance, legal counselling, etc.). *	Sensitize the general public on the issue of human trafficking. *	Improve the existing network for the assistance of victims. A key dimension of the SMWIPM is dedicated to amplifying the energy, ingenuity and imagination of young people, and enabling them to participate as active partners in peace building efforts. It is in this context the Movement organized the International Youth Forum “The Power of Youth for Peace”, from September 1-3, in Sharm El Sheikh – Egypt’s City of Peace. This youth inspired, organized and run event brought together over 800 youth and 400 adults from 100 different countries, to share ideas and perspectives on ways and ideas to eliminate violence and build a more peaceful and sustainable world. It offered all the participants an opportunity to go beyond the confines of age and gender, build bridges across cultural divides. In preparation for this event, the Movement and its youth volunteers worked extremely hard to reach out to young minds from around the globe, listening to their stories and channeling their advice into all aspects of the organizational process. This insight was used to select a wide range of topics, which focus on peace in its broadest and most holistic sense, taking into consideration the imperatives of human security, development, human rights and justice. During the closing ceremony, H.E. Mrs. Suzanne Mubarak invited participants to become the founding members of the Movement’s first International Youth Network. This network works to support and empower youth network members by creating platforms for dialogue and exchange, as well as organizing workshops and training opportunities to enhance their capacity to build peace by mainstreaming values such as justice, tolerance, cooperation and equality in the pattern of behaviour, communication and perception of their societies. In 2008, the Movement launched a peace education program for schools based on a "Peer 2 Peer" (P2P) model that enables leaders from the Youth Network of the Peace Movement to train younger students on the Culture of Peace. Through different arts, IT, environmental, and sports activities, the program aims to reinforce and strengthen the concepts of peace-building and protecting our environment. Network members used teaching and learning methods that encourage participation, cooperation, problem-solving, and respect for differences. In line with this program, a new Arabic manual on a Culture of Peace has been developed to train youth volunteers, students, educators and community leaders to disseminate effectively peace values and principles in their communities. Throughout summer 2009, the SMWIPM has worked hard to extend its efforts in fostering a Culture of Peace by creating new youth network groups across different governorates in Egypt, including Alexandria, Behera, Dakahliya, Damietta, Kafr El Sheikh, Ismailiya, Menoufia and Sharkeya. Each group is composed of around 15 young people aged 18-25, revealing a wide-range of interests and academic backgrounds. The Movement’s youth network also began laying down the groundwork for a new program to be implemented in youth centres. The underlying premise of this initiative will be to empower and foster an enabling environment for young people to connect meaningfully, share experiences respectfully and work together productively to positively affect their communities through various initiatives and projects focused on non-violence, health and education amongst others. Moreover, the SMWIPM has been providing opportunities for its network members to utilize the media as a catalyst for peace, disseminating key messages and achievements through radio and television programs, and developing monthly newsletters, video’s and various other publications. 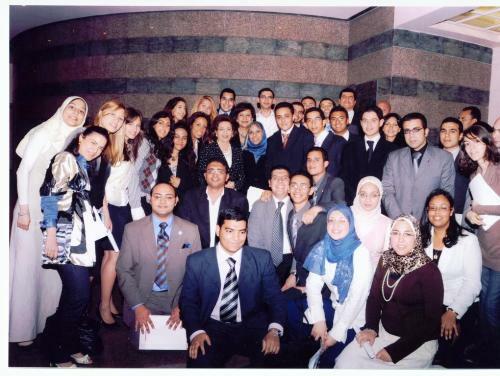 Another outcome of the Movement’s 2007 youth forum was the launch of the Cyber Peace Initiative (CPI) in cooperation with various partners, including the Global Alliance for ICT and Development, the International Telecommunication Union, Microsoft, Cisco Systems, and Intel as well as the Egyptian Ministry of Communications and Information Technology. CPI is a dynamic process that aims at systematically enhancing usage of ICT and Internet based tools to empower youth to participate actively in building sustainable peace and advancing United Nations Millennium Development Goals. The initiative rests on a “Culture of Shared Responsibility”, complementing other ICT driven initiatives - such as ICT for Development, ICT for Health, and ICT for Education. It is an integrated effort to rally the local, regional and international youth community to use ICT for the purpose of forwarding the cause of peace enhancement and fostering a Culture of Peace. It seeks to mainstream information technology skills amongst young people and engage them in the promotion of human security, intercultural understanding, empathy creation, and the exploration of different cultural and national realities. In a very short period of time, digital content has already been created in Arabic to teach non-violence, respect for diversity, dialogue, human dignity and tolerance in youth camps and schools. The Movement has also begun to develop awareness raising materials about peace in the form of posters, flyers and interactive educational CD’s on the Culture of Peace, to be disseminated through Peace Camps as well as the new Cyber Peace Mobile Unit. In line with the track on Internet Safety, we have begun to engage experts to train youth network members with the knowledge and tools necessary to protect young children from the risks presented by the Internet while maximizing their power for building peace and human security. The SMWIPM’s youth network has collaborated with various partners in Egypt to disseminate a respect for cultural pluralism, amongst children and youth, based on an active and empathetic knowledge of world cultures and welcome diversity as a source of enrichment. Through various cultural events, such as the One World Peace Festival, the Movement encourages young minds not to combat differences, but instead to explain and understand them. It works to help them to appreciate the importance of social interaction and dialogue as foundations for promoting a culture of peace. The SMWIPM Celebrating Diversity Initiative seeks to foster a respect for cultural pluralism, amongst children and youth, based on an active and empathetic knowledge of world cultures and welcome diversity as a source of enrichment. It is designed to encourage young minds not to combat differences, but instead to explain and understand them. It works to help them to appreciate the importance of social interaction and dialogue as foundations for promoting a culture of peace. In 2006, the Movement launched the first Institute for Peace studies (IPS) in the region. IPS acts as the academic arm of the Movement by developing educational and research programs designed to enhance the role of women and young people in human security and the process of peace building. Hosted at the Library of Alexandria, it also aims to bring together world renowned peace and security experts and researchers, form partnerships on both regional and international levels with various peace institutions and associations such as the collaboration already established with the United Nations Peace University in Costa Rica which shares similar objectives. In line with this programs and in collaboration Anna Lindh Foundation, the Movement organized several workshops to develop a curriculum for library and information science students and professionals that focuses on the relationship between identity and conflict, basic theories of peace and conflict resolution, and approaches to peace and conflict in library settings. Yes, our association has developed an awareness raising and training program designed to foster a culture of peace and nonviolence. We have trained over 300 young people to become Master Trainers of our Culture of Peace Program. In turn, they have been able to train over 2000 young people and 200 educators to date. The main challenge has been measuring the impact of our Culture of Peace program. The dissemination of Peace Education programs in schools and more political support to international and national associations working to build a Culture of Peace.